The history of Vittorio Restaurant cannot be told in two words, a history made of memories, atmospheres, flavours … of people that marked an era. This is the past to which we pay homage. The Vittorio of today lives on in the family: his wife, daughters and sons-in-law. We are the heirs of one of the greatest restaurateurs of the 70s and 80s and we are the custodians of his treasured culinary secrets. Every day, with commitment, passion and pride, we revive his recipes to offer our clients the true flavour of fish. Fisherman his father, fisher men his brothers, fish-seller in the market his sister, but not Vittorio; he suffered seasickness so instead of putting to sea in search of fish, he decided to cook the catch, following local traditions and recipes. (Panorama 2 July 1971). When his brothers returned to the harbour and moored up in the evening, Vittorio would start cooking. The smells wafting from his improvised kitchen attracted not only gourmets but also passing tourists and his fame spread quickly. Requests became so numerous that he was forced to anchor his culinary activities to the terra firma. So it was that he opened a dilapidated shop where he used an open fire for spit-roasting and grilling the fish. 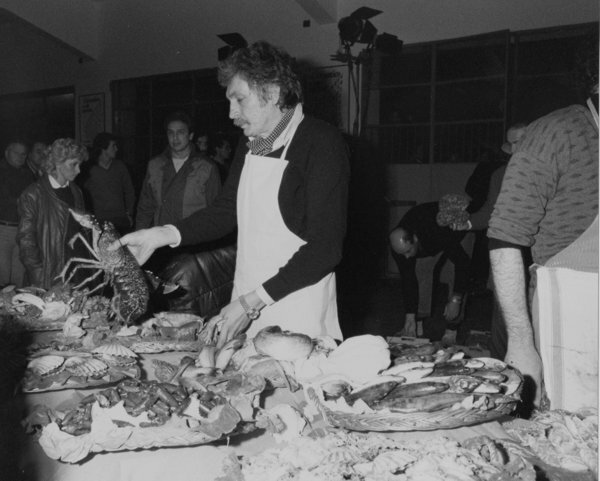 Here Vittorio welcomed not only passers-by but also the gourmets who, as experts, actively contributed to the preparation of the fish around the typical Romagnola “rola”. Just a few rickety tables with paper tablecloths … that’s how it all started. Gradually the shop, situated along the wharf of the Leonardesque harbour, started to attract several patrons from show business of those times. 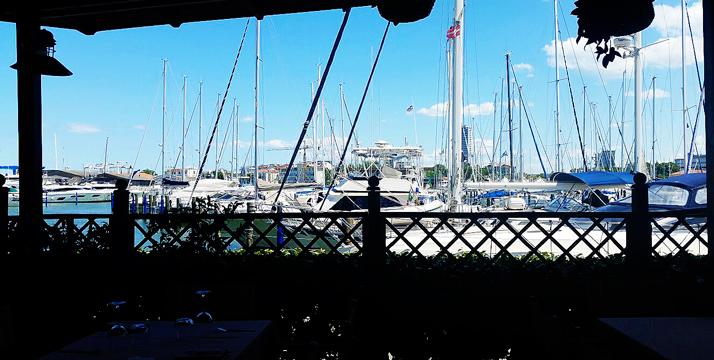 Then it became fashionable to go to Vittorio at the “Pesce Spada”, the new restaurant close to the sea front. The period of greatest success arrived in 1972 when Vittorio opened the “Trocadero” on the beach at Cesenatico and from there he became known throughout the whole of Italy. These were the years of economic boom and clients arrived from far and wide to sit at his tables. The “Trocadero” became one of the most famous restaurants in Italy, frequented by artists and people from show business such as Walter Chiari and painter Alberto Sughi, now part of Italian painting history. 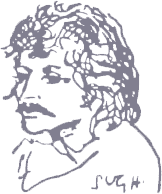 In fact, it was Sughi who, wishing one day to thank Vittorio, and after paying the bill as usual, presented him with the portrait that still hangs today as a symbol of that era. He passed away in 1994, leaving a great void… but his wife, daughters and sons-in-law carry on the business and culinary secrets, with love, passion and pride, aided by an excellent team. Wife Deli admits it was not easy at first: without Vittorio, even the tables were empty … but as time went by, and armed with great patience, the results could be seen! Vittorio Sea Restaurant is open everyday for lunch and dinner except on Tuesday and Wednesday at lunchtime. Please get in touch with us by writing at info@vittorioristorante.it. For reservations call us at 0547.672588. Please note that every booking must be confirmed by phone by our staff. * We are particularly careful to choose the freshest products to ensure high quality dishes. For this reason some dishes in the menu couldn’t be available.